Open and Sign up for a New Account. 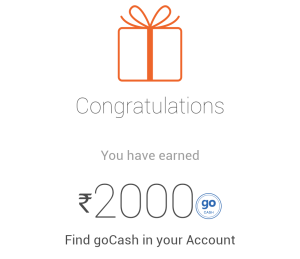 You will get Rs.2000 Gocash For Free Using our Refer Code. Verify your mobile number and Get Started. Go to Hotels > Select City and Hotel. Choose Hotel / Room Category worth Rs.2000 or more. Choose Pay and Apply coupon – “ASLIDOSTI” and Get 55% Discount. Click on upper left corner. There you will see an option of “Refer & Earn”. Share that code with your friend and You will get Rs. 400 goCash per referral and enjoy free traveling. So try Goibibo Android app and travel free without cost.